If you read last week’s blog, you’ll know I was planting trees this past weekend. Hope you got your hands dirty too. One of the gentleman who was volunteering at Lemoine’s Point knee-deep in mud yesterday told me that his great great grandfather was a brick layer who came over from England. He had designed and built the portico in our Parliament Buildings in Ottawa. We also got into an interesting conversation about physical education in our school’s system, and how children need daily exercise in order to focus and do well in school. He cited studies that showed students did dramatically better on math tests when they engaged in 60 minutes of exercise immediately before testing. We go to school, take courses, attend workshops and conferences to learn, and yet one of the most easiest and free ways to learn is simply by talking to people. Especially strangers. When you talk to a stranger, you are more likely to learn something new and see things from a whole new perspective. Travelling is wonderful for this. When I travel, I always talk to the person sitting next to me. On recent flights, I’ve met a girl who worked for Mastercard who was a personal consultant to high net worth clients (she advised people with millions of dollars on how to get the most of their card purchases). One time I sat next to a songwriter from Nashville who was on his way to Chicago for a high school reunion. He had written songs for stars like Willy Nelson. When I was in New Orleans this March, I had lunch at a diner style place (these places are great for single travelers who don’t want to eat alone) and met the priest from St. Louis Cathedral who told us what it was like to live in the middle of “bedlam” as he referred to living on the edge of Bourbon Street. My cab driver who drove me to the airport told me he had just signed up for Obamacare which led to an interesting discussion on health care in the United States. Even when I’m travelling to Toronto or Montreal on business on the train, I try to shut my laptop down for 20 minutes and talk to the person sitting next to me. We can learn so much if we reach out and talk to people. This week’s Happy Act is to talk to a stranger. Strike up a conversation, ask about what they do, their family. I’d love to hear what you learned, so leave a comment and share your experience. A special note to parents this week: One of my biggest pet peeves as a parent is when I hear another parent say to their kids “Don’t talk to strangers”. I remember years ago going out for Dave’s mother’s birthday for a family celebration to a restaurant in Burlington. Next to us, another family was celebrating a birthday. Dave’s Mom, who was around 65 at the time leaned across and said a few words to the young girl, and her mother hissed at her to not talk to strangers. Dave’s Mom was crushed. Do we really want to teach our children not to talk to other people? I get the safety thing, but there is a HUGE difference in engaging in polite, idle conversation with people, and getting in a car and going somewhere with them. We’ve taught our children the difference, and things like code words to keep them safe. But telling them not to engage with others and learn from others is so terribly sad. If you have young children, I beg of you, please banish this phrase from your vocabulary. I drive the kids crazy talking to strangers. They complain we never get anywhere because I am always saying hi to people. Met a fellow yesterday in a field by our place. He was carrying a bucket and brush and a grocery bag. Turns out he was going to our community arena and playground and cleaning any graffiti off. Says he goes out a couple of times a month to do this. What a great community member. Karrie: I laughed when I read your comment, but it did remind me of something else I wanted to say. 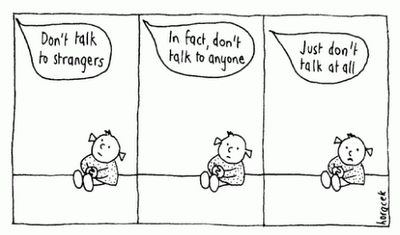 By talking to strangers, we learn more than just new information. We learn most about ourselves, our own prejudices, blind spots, we learn about compassion. Someone who saw that man might have jumped to conclusions about what he was doing with a bucket, brush and grocery bag, but you learned he was doing something for the community.